Maria Wallace is a singer, songwriter and musician based in Yorkshire, in the north of England. 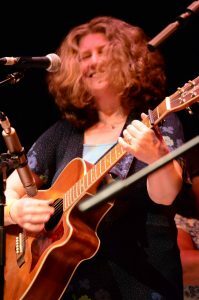 She performs both original and traditional music – bluegrass, folk/roots and Americana, with a broad range of influences from rock and blues to old time Appalachian fiddle tunes. Maria performs regularly with her bluegrass/Americana band The Reckless Abandoners as well as occasional collaborations with other musician friends. Maria is also an increasingly successful grassroots music promoter and booking agent under the True North Music banner. Since 2015 she has put on over 30 gigs by some of the best bluegrass, Americana and folk artists from the USA, Canada, Ireland and UK, and in October 2017 Maria won the Outstanding Promoter Award at the Yorkshire Gig Guide Grassroots Awards. To date Maria has hosted fantastic concerts by The Railsplitters, Front Country, Sierra Hull, Jaywalkers, Molly Tuttle, Anna & Elizabeth and The April Verch Band to name just a few. Since summer 2016, True North Music has also been increasingly in demand to book full UK tours for a number of world class artists in these genres, and is currently booking for The Slocan Ramblers, John Reischman & The Jaybirds, Ron Block, Tony Furtado and The Honey Dewdrops among others. In addition to her music making, songwriting and music promotion, Maria remains an enthusiastic fan of and advocate for the music, and writes regular articles, reviews, interviews and previews for her own websites and for various roots music print publications (British Bluegrass News, Old Time News) and online music magazine Folk Radio UK.